Opel's 120 Year Anniversary Event. Trade-in & Trade-up. Find the perfect Opel van to drive your business forward. Opel. The Future is Everyone’s. Offer available at participating Opel dealerships on 191 Movano or Vivaro models registered before 31st March 2019. Trade-in vehicles must be 2012, or older, registered in name of purchasing customer for a minimum of 6 months and have a valid NCT. Scrappage allowance amounts vary by vanline. 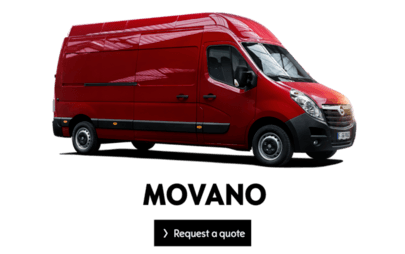 Fuel economy Movano: urban: 7.7-9.6, extra urban: 6.8-9.2 combined: 7.2-9.3. C02 emissions: 186-242g/km. 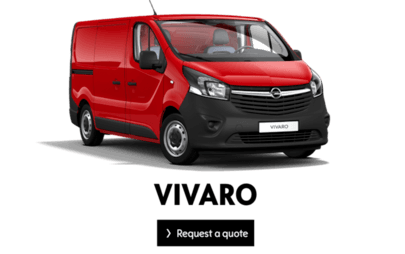 Fuel economy Vivaro l/100km: urban 7.1 – 8.0, extra urban 5.6 – 6.6, combined 6.1 – 6.9. C02 emissions 160-178g/km.